Welcome back everyone, it's been a long time since my last post here. My "offline" life got hectic last Fall and I let this go. Since the Avengers movie comes out this week, I figured it was a great time to restart this blog, with a look at what is likely the best-remembered issue published during Assistant Editors' Month: The Avengers' appearance on Late Night With David Letterman. 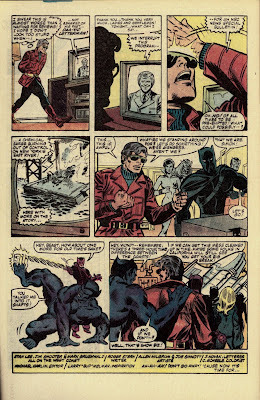 Assistant Editor Mike Carlin once again "took over" for regular Editor Mark Gruenwald. 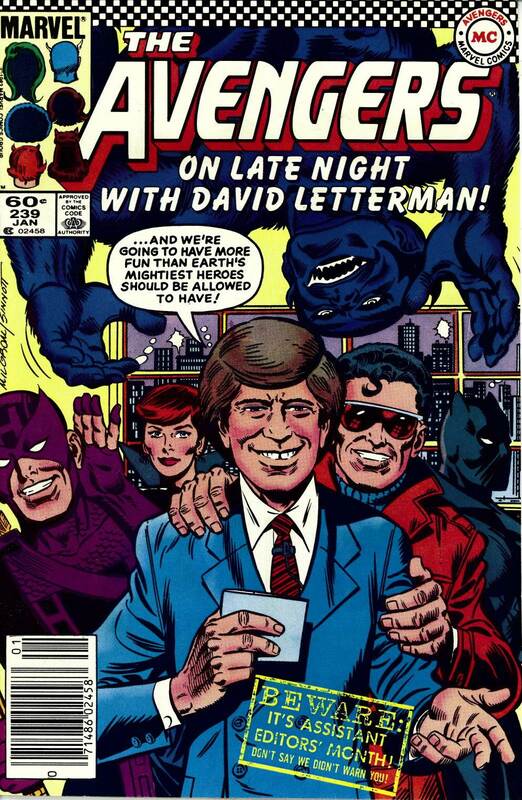 Letterman show in The Avengers? and they shook hands. He was integral to the story itself. 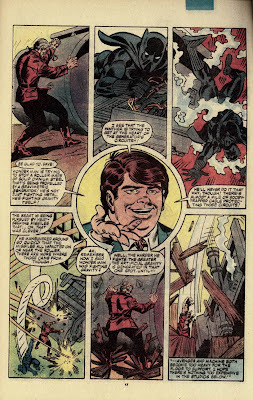 villain for the Avengers, called Fabian Stankowicz. 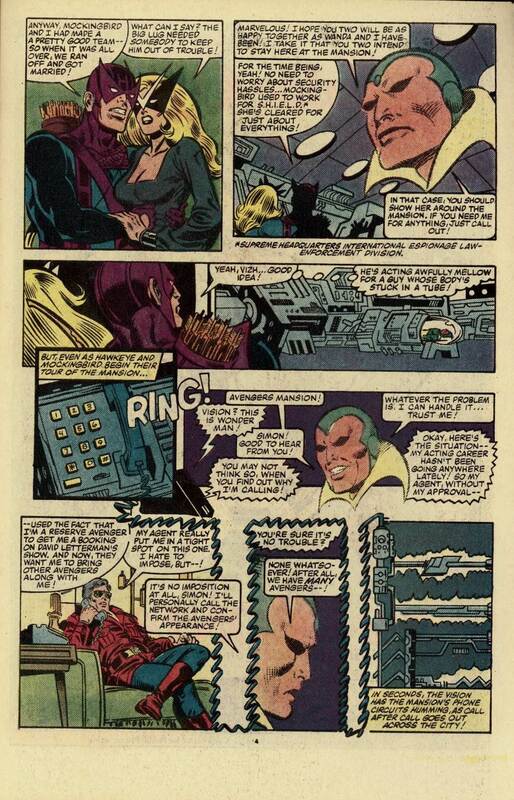 FINGEROTH: Was the issue in the middle of a storyline? 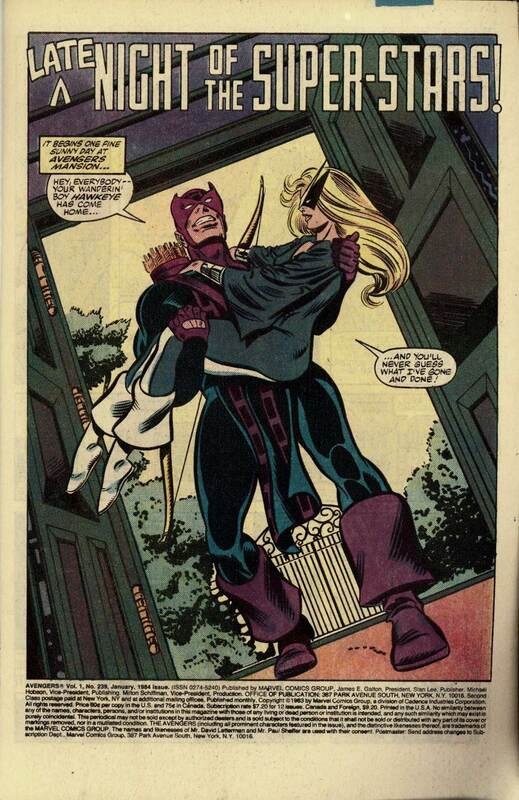 in current continuity at the time. 'Late Night Of The Super-Stars' was written by Roger Stern, Penciled by Al Milgrom and inked by Joe Sinnott. 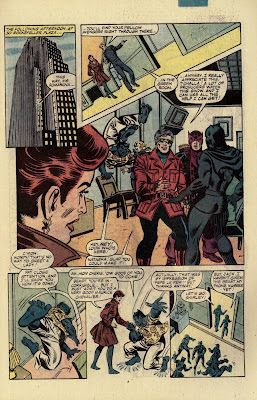 We open with Hawkeye returning to the Avengers' mansion for the first time in months. He's brought his new wife Mockingbird to meet his teammates. 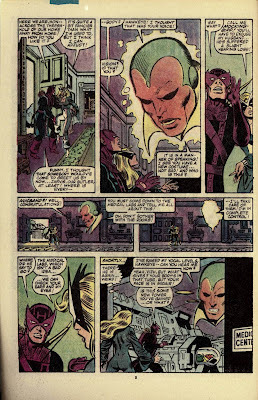 Hawkeye is startled at the Vision's appearance, they both recount their recent adventures (Note: On my other blog, I recently reviewed a reprint book that details how Hawkeye met and fell for Mockingbird, read that review here). 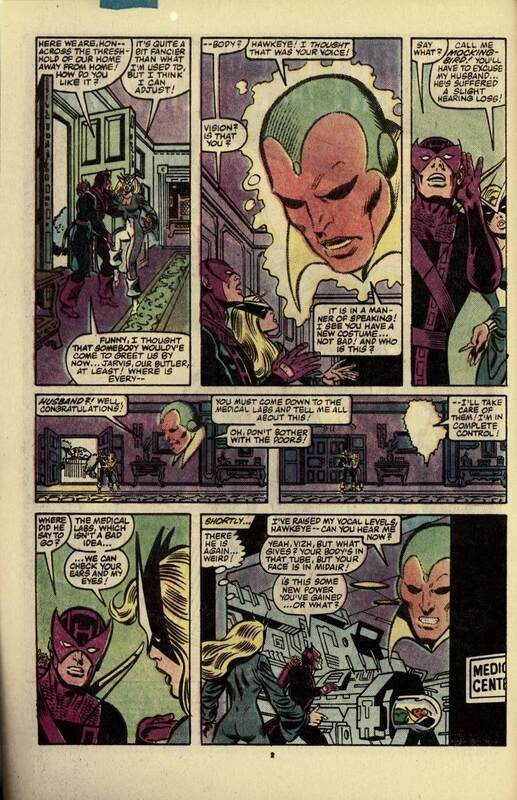 When Hawkeye steps out, Vision gets a call from his "brother" Simon Williams, AKA Wonder Man. Wondy's acting career hasn't been going well, so his agent arranged for him to appear on Late Night With David Letterman! But, Letterman's people want him to bring along other Avengers. 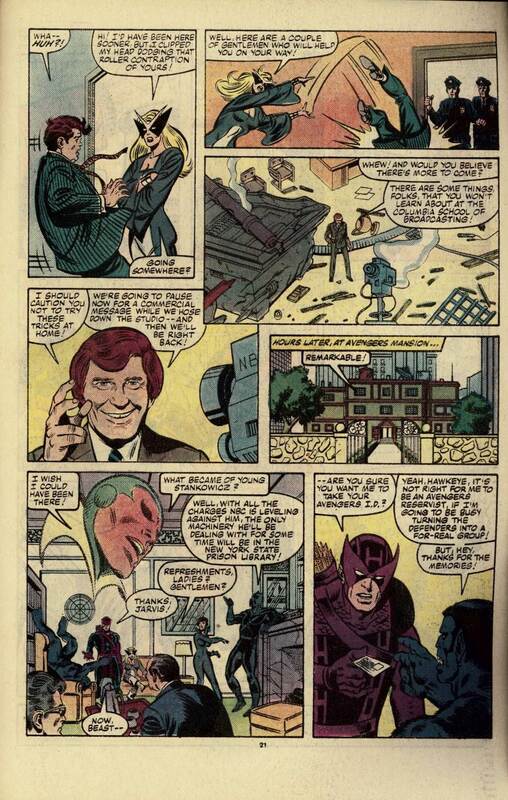 With most of the team away in California, Vision calls several reserve Avengers to see if they (along with Hawkeye) can appear on Late Night. 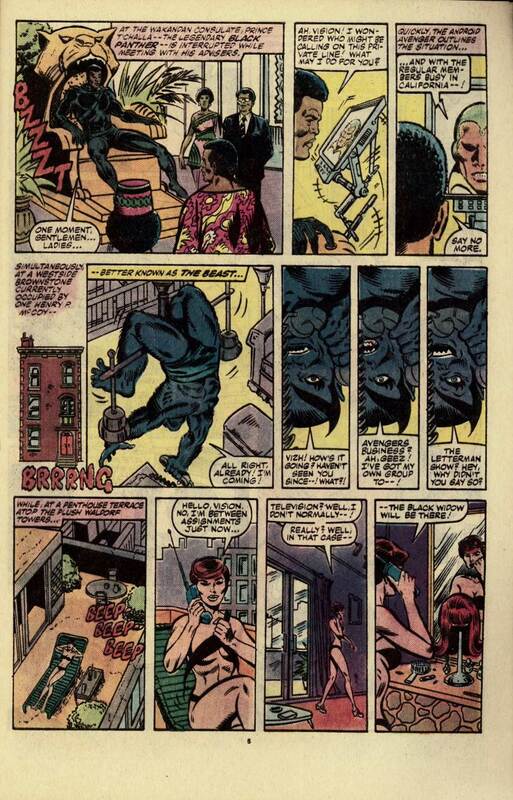 Black Panther, Beast and Black Widow agree to accompany Wonder Man on the show. 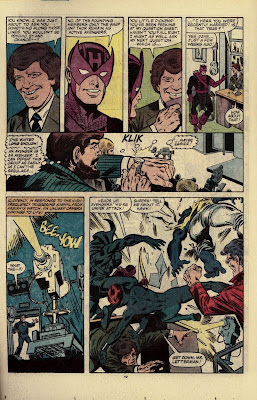 Bumbling "genius" inventor and wanna-be super-villain Fabian Stankowicz (who was easily defeated by the Avengers in issues 217 & 221) learns of the Avengers booking on Letterman and thinks 'Late Night' will be a good place to exact revenge. The Avengers all arrive at NBC Studios at 30 Rockefeller Center in New York and exchange pleasantries. 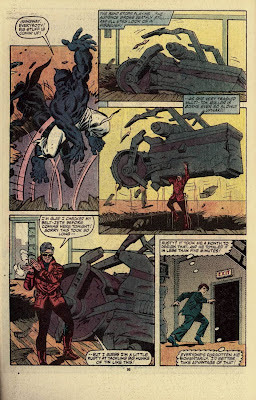 Meanwhile, Stankowicz disguises as a repairman and rigs up trap for the Avengers before joining Letterman's studio audience. 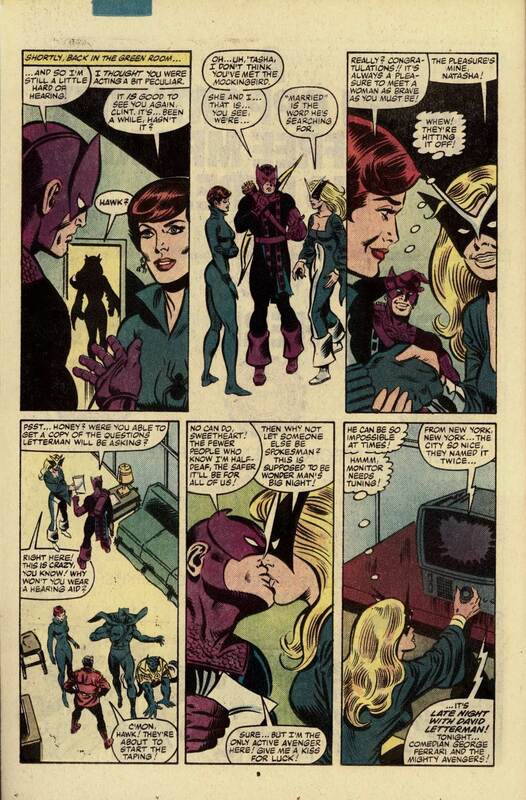 Hawkeye is nervous about how ex-girlfriend Black Widow will get along with his wife Mockingbird, but they get along fine. 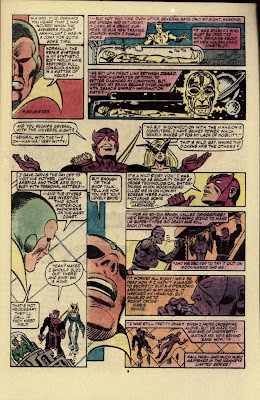 Hawkeye is also fretting over the fact that he's having hearing problems (as a result of a recent battle). He doesn't want this to become common knowledge (it would tip off his enemies that he's not 100%). Finally, it's show time! Letterman appears on stage for his monologue. Bandleader Paul Shaffer is wearing a Captain America t-shirt in honor of the Avengers. 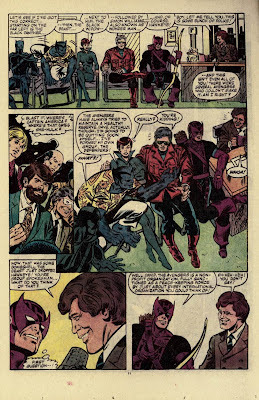 The Avengers join Letterman, their interview begins with a surprise announcement from Beast: He's quitting the Avengers to devote more time towards making the Defenders a "real" team. Stankowicz is angry, these "Avengers" aren't the same group of heroes who previously defeated him. 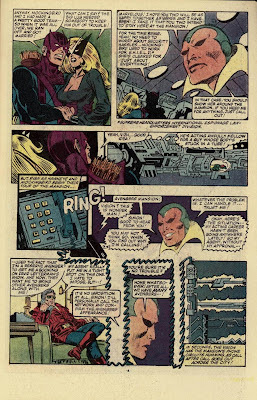 Stankowicz figures, "An Avenger is an Avenger", and decides it's time to attack; he activates a camera that shoots laser beams at the Avengers! 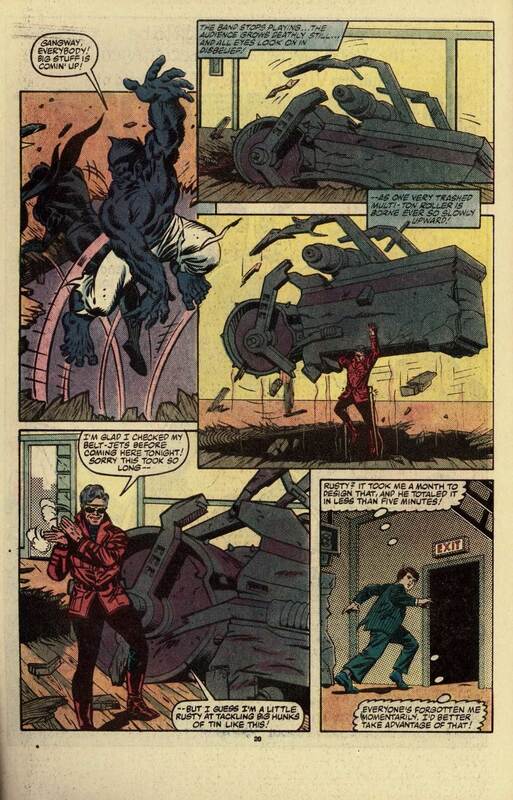 Elsewhere in 30 Rock, a dumpster turns into a "metal roller" (Roger Stern's words, not mine!) 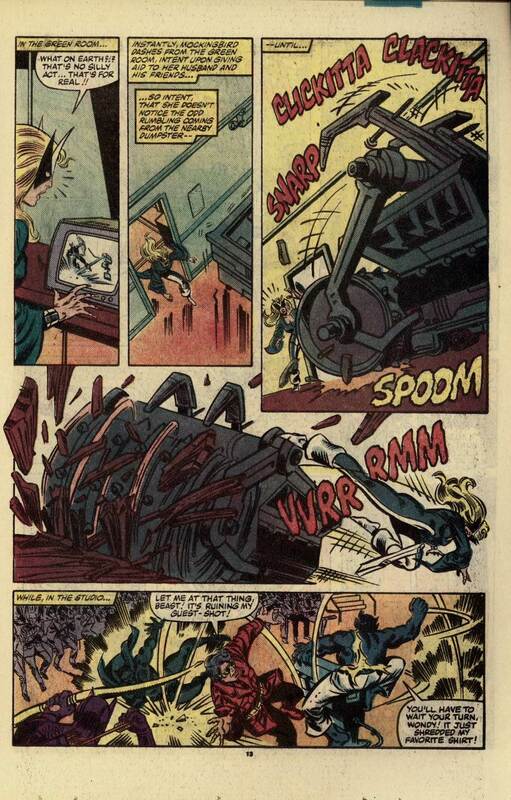 and attacks the Avengers...destroying Beast's favorite shirt in the process! 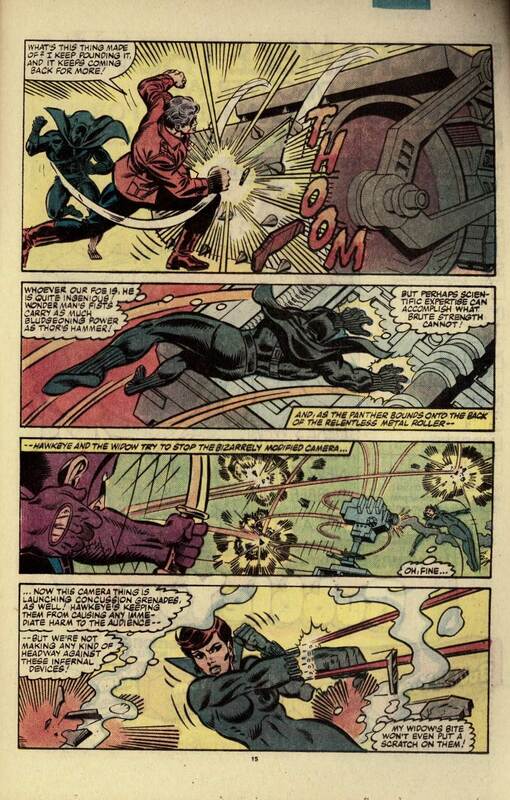 Black Panther & Wonder Man try to stop the roller, while Hawkeye & Black widow deal with the laser camera. 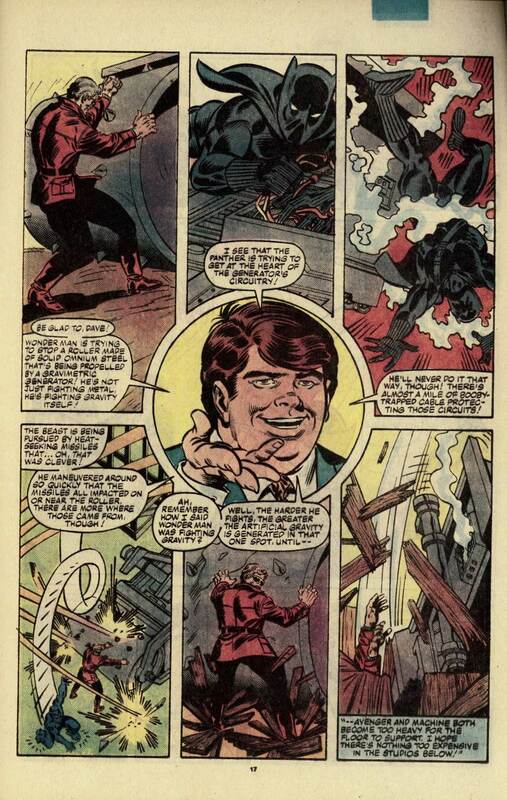 Stankowicz believes the Avengers are doomed and decides to introduce himself to Letterman and his viewers. 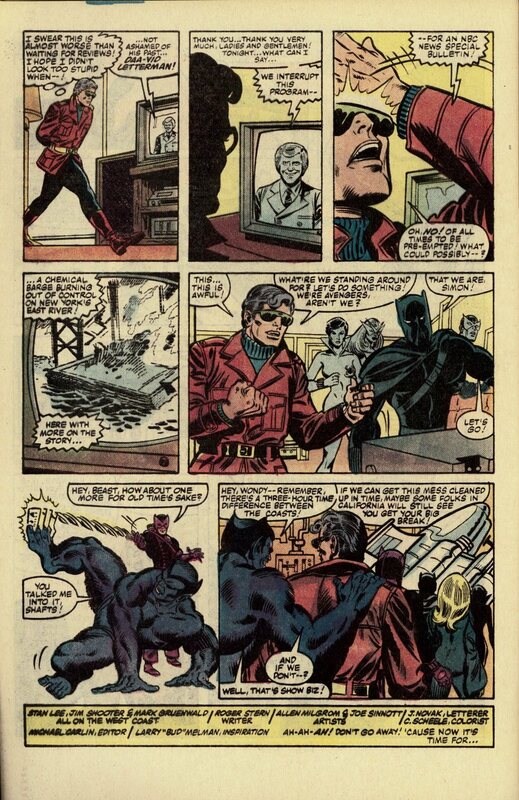 He says he invented the gizmos that attacked the Avengers, just to prove it could be done....and to make a name for himself. Letterman realizes he's dealing with a disturbed individual. Stankowicz goes on to detail how his devices work. 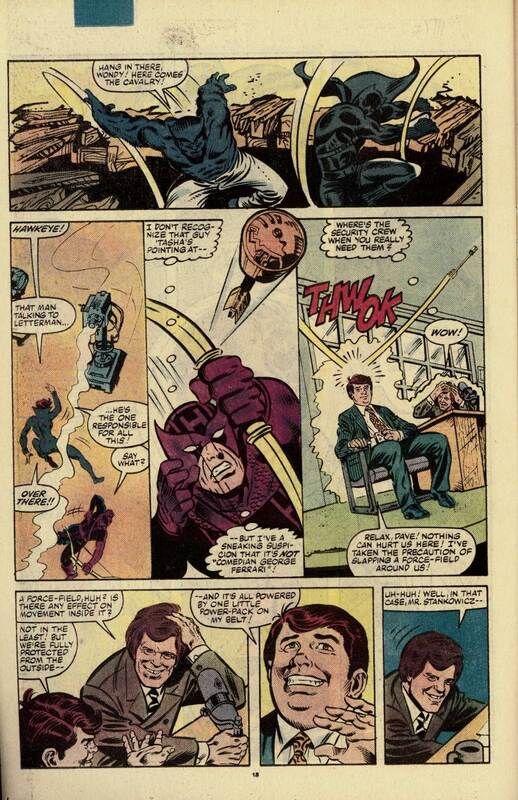 Hawkeye shoots an arrow at Stankowicz, but he and Letterman are protected by a forcefield. Finally, Letterman snaps into action and knocks out Stankowicz with the Giant Doorknob! 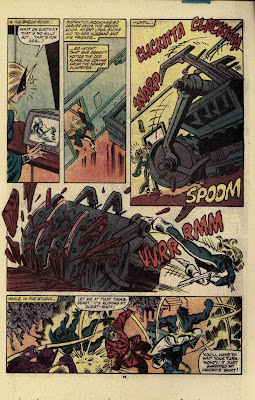 The Avengers make quick work of Stankowicz's machines. 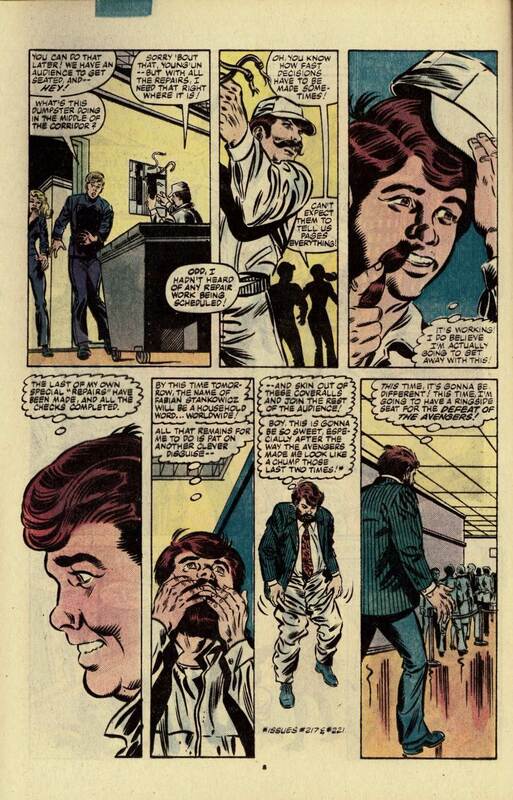 Stankowicz makes a run for it, but runs into Mockingbird, who hands him over to the police. 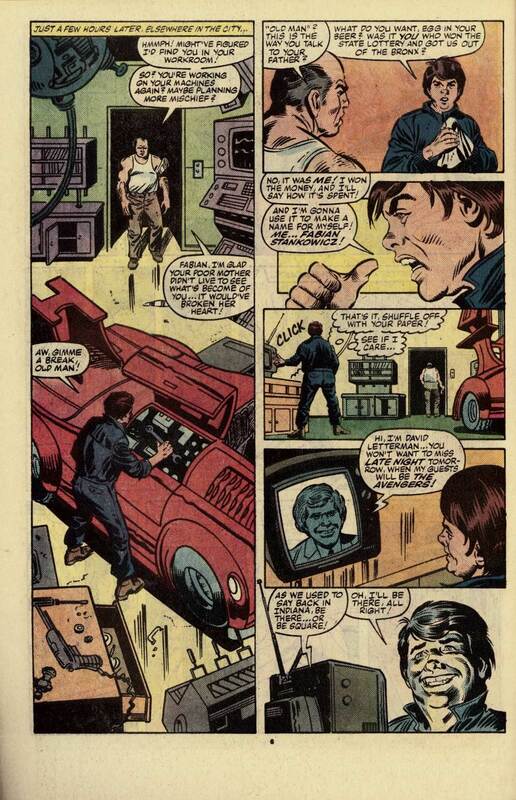 Wonder Man eagerly anticipates the show hitting the air, but the telecast is interrupted by an emergency news bulletin! 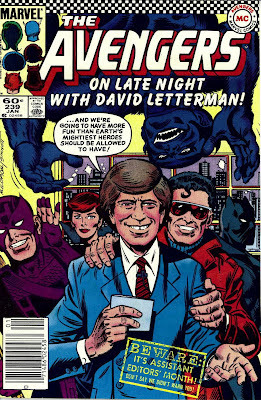 That Wonder Man won't get the exposure from the Letterman show. But then he listens to the report, and hears that a ship carrying chemicals is on fire in the East River. The Avengers (led by Wonder Man) rush of to rescue the ship. 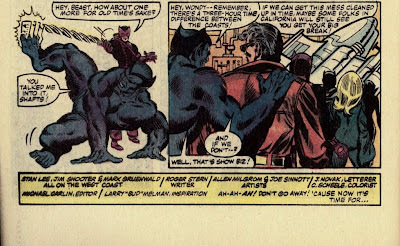 If you check the "funny credits" (a trademark of AEM) above, you'll see it reads "Stan Lee, Jim Shooter & Mark Gruenwald All On The West Coast", and Larry "Bud" Melman is credited for inspiration. 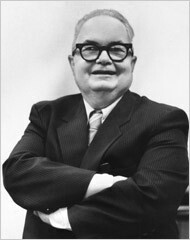 In case anyone reading this doesn't get the reference, "Bud" Melman was a very funny recurring character on Late Night played by actor Calvert De Forest. He later followed Letterman to CBS and made appearances on the show until his death in 2007. Following the story, we get "Michael Carlin's Page O'Avengers Stuff" (similar to a feature Carlin wrote in Crazy magazine) instead of the normal letters column. 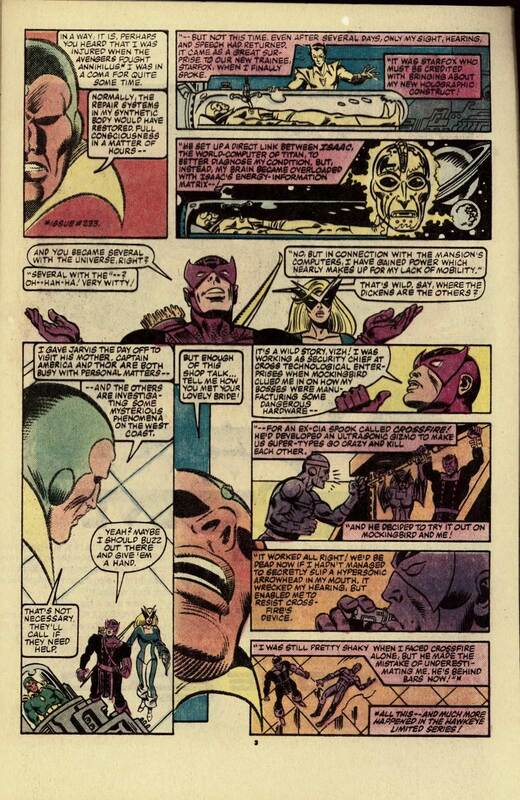 Carlin schools a fan who wants a Marvel "No-Prize". 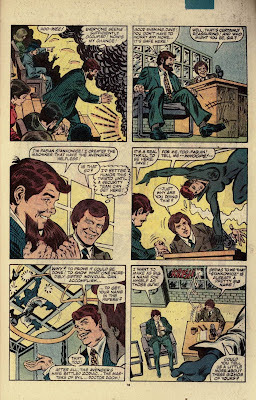 He also holds up a sign that displays the shoe sizes of the Avengers creative team. At the bottom of the sign, there's another reference to Larry "Bud" Melman. 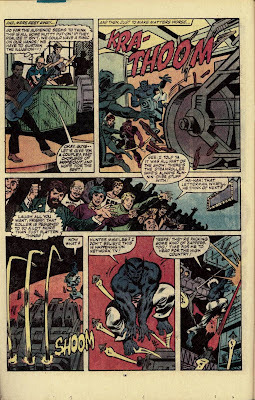 With two mentions in the same issue, I'm wondering why Melman didn't make an appearance in the story. Maybe he didn't sign a release? 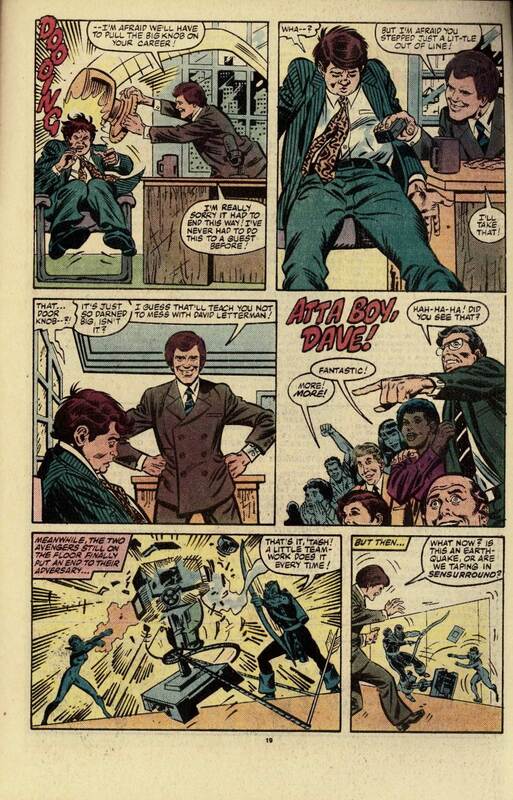 All in all, this is a very funny issue, probably the high point of Assistant Editors' Month. I was a big fan of Letterman and Marvel Comics when this came out, so this has long been one of my favorite comic book stories. 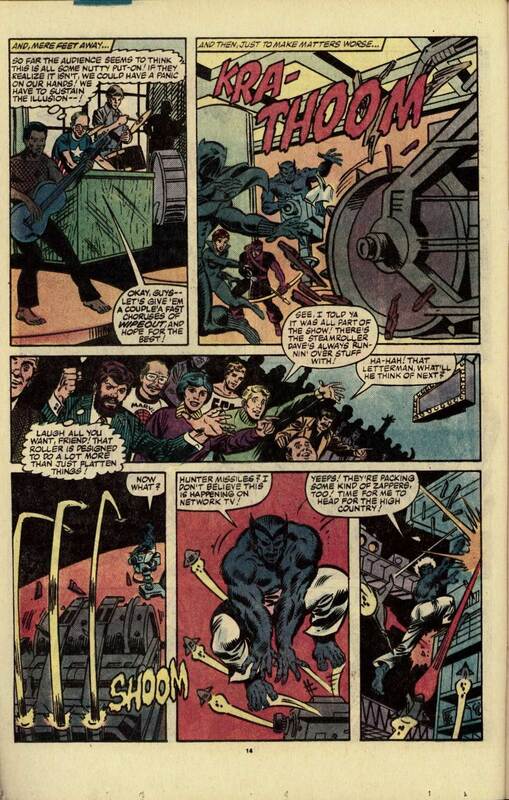 I'd like to thank Roger Stern, Al Milgrom, Joe Sinnott and Mike Carlin for making this story happen back in '83! 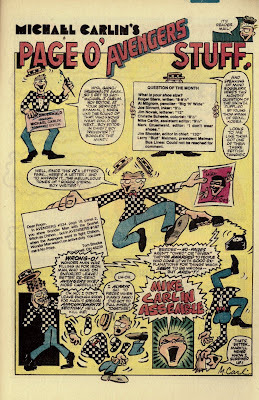 Dazzler visits the San Diego ComiCon! Thanks Lee, it's good to be back! I'll try to update this every week now, until I've covered issue. 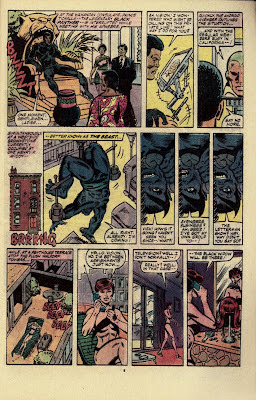 Found you via your link in the CBR post. Great job here. Plus a link to a Hawkeye mini-series review! Thanks for stopping by Mock!, 'Stay On Target' looks great too, I just subscribed. 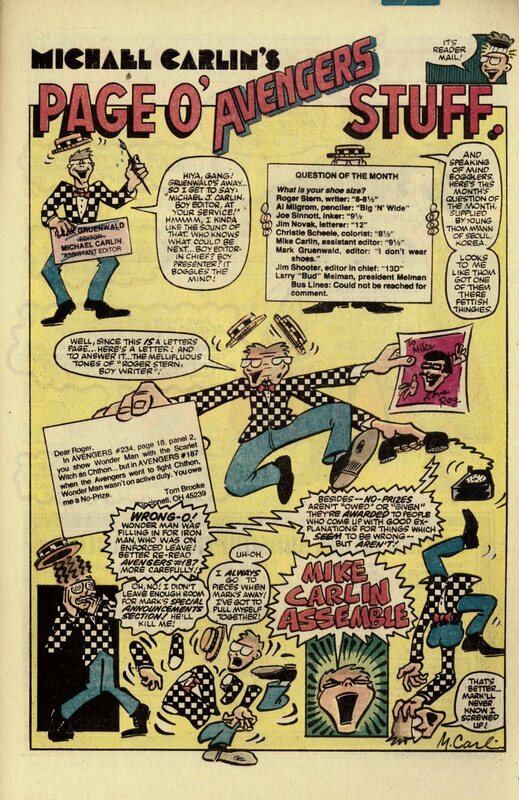 Love that Murphy Anderson 'Plop' strip. 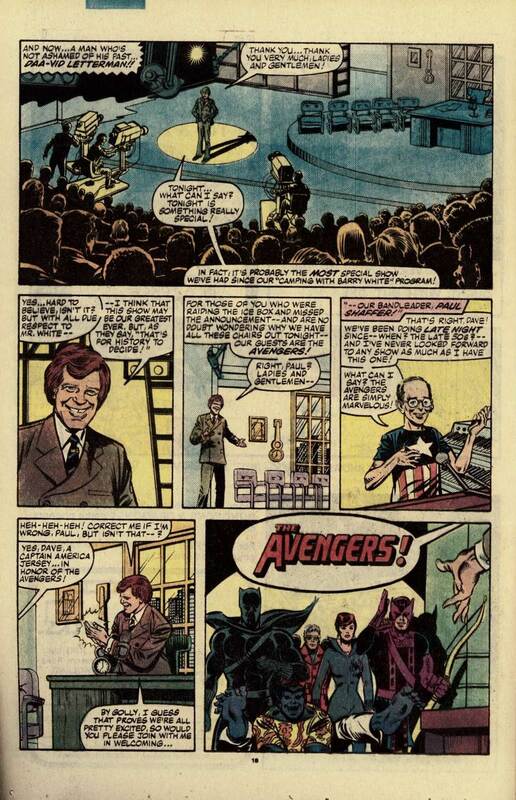 Larry 'Bud' Melman should be an honorary Avenger at least! The only thing missing here is one of Dave's top ten lists. 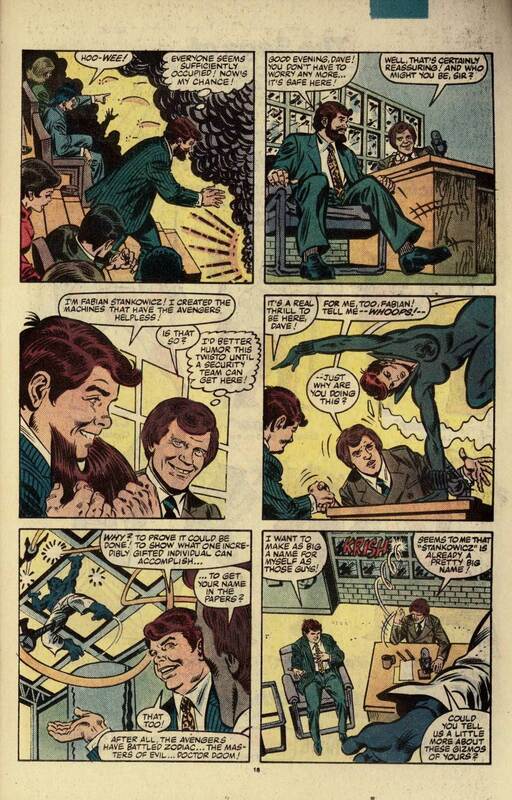 Mars, hard to believe, but this issue came out 2 years before Letterman started doing his "Top 10" lists.